The University of Belize (UB) in collaboration with the Ministry of Education, Culture, Youth and Sports and the European Union (EU) held a special closing ceremony to acknowledge the achievements of the Sugar Belt project on Saturday February 24, 2018 at the Muffles College High School Auditorium in Orange Walk Town. “Nature has blessed thee with wealth untold”. Mr. Mads Korn, European Union Project Manager shared special remarks reflecting on the project, “This project reflects our commitment to supporting the government to realize its development goals and what better way to demonstrate this than by investing in the upgrading of childhood and secondary education for the youth in Belize! UB President Professor Emeritus Clement Sankat in his opening address commended the Dean of the Faculty of Education and Arts and his Faculty and Staff who participated in this project for a job well done - one that will leave a lasting development in terms of trained teachers for the northern communities and to UB itself in terms of the embedding of new programs in teacher education in our offerings. The theme of the ceremony was “Development through Education”. The top achievers for the project were recognized for their outstanding academic performance - Sucely Hill completed her Associate Degree in Early Childhood Education; Alisa Danielle Puck the Bachelor in Education with Concentration in English; Denzel Anthony Amstrong completed his Bachelor’s Degree in Education with Concentration in Mathematics; Arelie Eunica Mendez Canul the Bachelor in Education with Concentration in Science; Anita Elizabeth Blanco, Bachelor in Education with Concentration in Social Sciences; and Matilda Dorita Mendez, Bachelor Degree in Education with concentration in Spanish Education. 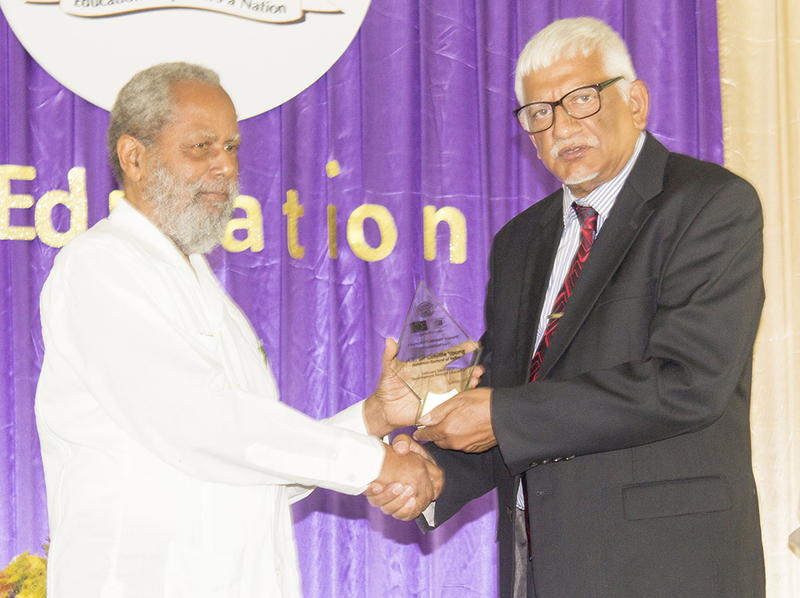 Recognition awards were also presented to the Ministry of Education, European Union and the University of Belize. 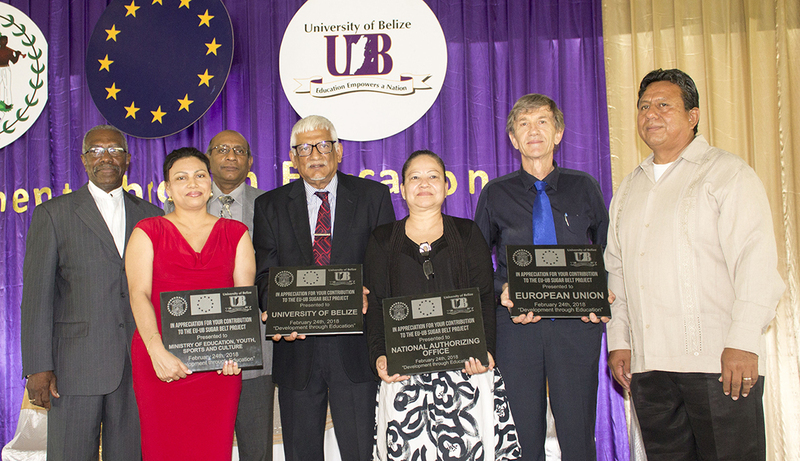 The University of Belize thanks the Government of Belize and the European Union for their tremendous support. Through the Sugar Belt Project, a total of 395 persons had the opportunity to upgrade their skills and receive certification in teacher education including at the Early Childhood level during the period June 2015 – February 2018. 20 teachers received certificates; 28 received an Associate’s Degree while 116 in-service teachers participated in Continuous Professional Development in Early Childhood Education. Meanwhile at the secondary level 20 teachers got their Diploma in Secondary Education, 111 received a Bachelor’s Degree in Secondary Education, and 100 parents were sensitized about the benefits of Early Childhood Education. The project valued at approximately €1,2M (BZ$ 2.6M) was funded by the European Union along with the Government of Belize and the University of Belize. Its overall objective was to improve the quality and relevance of early childhood and secondary education in northern Belize. The Target Groups were uncertified Early Childhood and Secondary Teachers in Northern Belize; licensed teachers who required continuing professional development; and teachers and parents of children at the Early Childhood level in remote communities in northern Belize. 3. Increase access to early childhood education for parents, teachers and children in remote communities. (1) The Faculty of Education got training and experience in training teachers to use the competency-based and play approach to teaching. (2) The Faculty got experience in teaching using a blended approach (online and face-to-face) as eight courses were so developed. (3) The secondary education bachelor’s degree program which was offered in the Banana Belt Project was strengthened as a result of the Project. (4) UB has added experience in administering EU project. (5) And most importantly, UB is using information from this Project and has developed its own ECE Associate Degree program which started in August of 2017 in Belize City, and in the South, Punta Gorda.